In a burst of rule-making, federal agencies have toughened or proposed new standards to protect Americans from tainted eggs, safeguard construction workers from crane accidents, prevent injuries from baby walkers and even protect polar bears from extinction. . . The surge in rule-making has resulted from an unusual confluence of factors, from repeated outbreaks of food-borne illnesses to workplace disasters. Some industry groups, wanting foreign competitors to adhere to the same standards they must meet, have backed new federal mandates. The push for some of the measures began at the end of the Bush administration, a tacit acknowledgment that its deregulatory agenda had gone too far. . .
David Michaels, who became head of the Occupational Safety and Health Administration in December, has asked Congress to allow the agency to impose much larger fines and criminal penalties on employers that knowingly leave their workers at risk. The agency also is adding dozens of inspectors. "Fourteen workers die every day in preventable events all across the country," Dr. Michaels said. "We have to turn up the volume to make it very clear that OSHA is on the job." Dr. Michaels typifies the new breed of regulator installed by the Obama administration. Just like, contrary to "conventional wisdom," air pollution's been declining for years--including under Bush. I don't oppose all regulation, and I willingly concede that some health and safety regulation is both necessary and effective. Still, lefties and the media don't understand cost-benefit analysis and the decreasing returns to ramped-up regulatory oversight. Rather, they "seem convinced the end is near, and zero is the only appropriate ceiling." 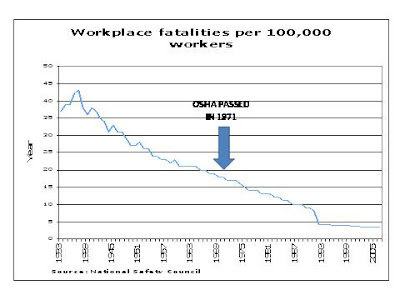 Financial incentives like workers comp rates are a FAR more powerful force, at least in my business, to root our safety issues than the arcane and bureaucratic mandates that flow out of OSHA. Because not even the Obamessiah can rid the world of risk. The choice is never between good regulation and corporate bandits allowed to run wild. It is a choice between our current regulation - mixed at best - and some new regulation - mixed at best. It is the descendant of the marxist argument that communism would work well if only it were tried properly with the right people. But any form of government works well such conditions - even tyranny. What sets free markets and free governments apart is that they work reasonably well even under bad conditions. They are a damage-limiting strategy in a world of imperfect people. As we will always have some bad conditions in this fallen world, that's the point.